Put another way, the German business culture may not have as much tolerance for mistakes as Americans. “We don’t hold hands and sing ‘Kumbaya,’ ” Whyte says with a laugh. The Virginia Beach facility serves as the headquarters for U.S. operations for the worldwide Stihl Group, based in Germany. 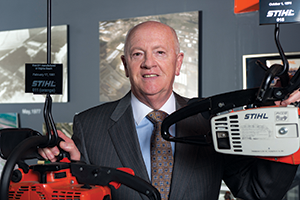 Andreas Stihl started the company in 1926, and it continues to be a family-owned business today. It develops, manufactures and distributes power tools for the forestry, agriculture, construction, tree-care and landscape industries as well as for homeowners. Products include the Stihl chain saw brand, the world’s top-selling brand since 1971. They are distributed through a network of 40,000 dealers in more than 160 countries. The company began production in Hampton Roads in 1974. Four years later, it moved to its current location in Oceana Industrial Park. The company decided to establish a presence in the U.S. because it is the largest single market worldwide for Stihl’s products. “If you are going to be a player, you have to be in the market,” Whyte says. Stihl was attracted to Virginia Beach for a variety of reasons. One of the main motivators was the area’s deepwater port with worldwide access. “The company had an eye toward the future and exporting,” Whyte says. The Virginia Beach facility exports to about 90 countries around the world. The company also benefits from the area’s skilled workers, many of whom are ex-military. “The military provides training that we require here,” Whyte says. Employment at the Virginia Beach facility has grown from 50 employees to more than 1,900 workers. It produces and distributes more than 275 models of handheld outdoor power equipment. Nationwide it has more than 2,100 employees. The plant has expanded several times to accommodate the manufacture and final product assembly of various components. It is currently situated on about 150 acres with more than 2 million square feet under roof. The last expansion, completed in 2012, added 57,742 square feet. The company has posted sales records every year for the past 22 years with the exception of 2009, the depths of the Great Recession, when it still showed a profit. In recent years sales have grown to more than $1 billion annually. In 2009, Stihl Inc. became a Foreign Trade Zone, an area geographically in the U.S. but legally considered outside the country for customs purposes. The designation allows the company to import components at a duty-free rate and receive the benefits of duty elimination, reduction and deferral. The founding company began exporting to Russia, Canada and the U.S. in 1931. Its U.S. headquarters started exporting in the mid-1970s to a variety of countries including Brazil. It also imports product and raw materials from South America. “Brazil is an interesting country,” says Whyte, who frequently travels to Sao Paulo. On average an employee from Germany visits the Virginia Beach facility three weeks out of every month. “We also send people to Germany, Brazil and Switzerland to become more culturally astute and learn how to do business,” Whyte says. The company believes in continuing education. It has both job sharing and an apprenticeship program in manufacturing where employees receive hands-on training coupled with classes at Tidewater Community College. The program is similar to a model used in the German headquarters that combines on-the-job training with classroom learning. “Our apprenticeship program here has benefitted from Germany’s dual-system model,” Whyte says. The biggest city in Brazil, with more than 11 million people, Sao Paulo is one of the 10 most populous cities in the world. It is the financial epicenter of Brazil, housing the Sao Paulo Stock Exchange, the Cereal Market Stock Exchange and the Futures Market. The city has a large concentration of foreign businesses, including many German and Swedish-based companies. Industries in the city include automotive, manufacturing, science and technology. The Forbes list of the top billionaire cities ranked Sao Paulo sixth last year. Major businesses in the city include telecommunications firms Telefonica and Vivo, brewing company Ambev, Switzerland-based Nestlé, consumer goods company Unilever and steel maker Cosipa. Twenty internationally based firms have their U.S. or North American headquarters in Virginia Beach. Target industries include advanced manufacturing, biomedical and life sciences, defense, information services, maritime and logistics. Virginia Beach is the only city in Virginia with no machinery and tools tax. It has established an office in Dusseldorf, Germany, to help European businesses interested in Virginia Beach. Last year the city added 17 businesses such as Germany-based Prufrex. In addition to Stihl, some of the city’s larger employers include sign company Architectural Graphics, manufacturer M & G Electronics Corp., Sentara Healthcare, organ procurement organization LifeNet Health, Christian Broadcasting Network, Gold Key/PHR Hotels and Resorts and Amerigroup (a part of WellPoint) which manages publicly funded health programs.